Sierra Designs Sweet Suite 2 Tent is a new lightweight tool launched in September 2017 for the season 2018. The tent is a semi-freestanding type, read more below. 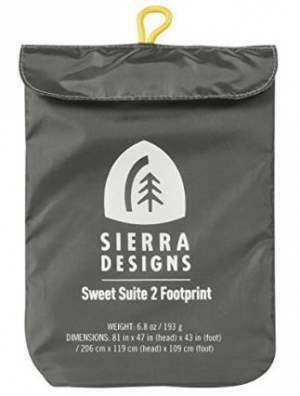 Sierra Designs Sweet Suite 2 Tent – 2 Person, 3 Season. Fast & easy Y-pole setup. Stargazing configuration with the fly. The Sweet Suite 2 is a part of a completely new series launched recently (September 2017) for the season 2018. The series included tents shown below, for 2 and 3 people, both built in the same style. Sweet Suite 2 on the left and Sweet Suite 3 on the right. The weight is quite impressive, only 3 lb 10 oz (1.64 kg). So you realize, this is a weight which is normal for solo tents, but here you have a full-size 2-person tent with 2 doors and 2 vestibules. 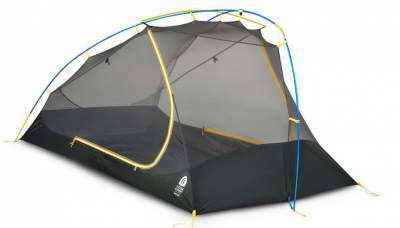 This is a 3-season tent, so you have the usual inner tent and the full-coverage fly. They describe it as semi-freestanding. If you are not familiar with this terminology, there us more in my separate text. Here, just to stress that this implies a Y-shaped hubbed pole system, more below. Semi-freestanding Sierra Designs Sweet Suite 2. From one side, the Sweet Suite 2 tent looks like an ordinary dome tent, this is the side where the Y-shaped pole system is with two ends in the grommets. But on the other side you have only one pole going to the ground, see the picture below. This tripod structure is not unique, but here you have several details added. The tripod type Y-shaped poles. The Y-shaped main poles and the ridge pole. The side with 2 poles is with prebent sections, and this gives extra volume. On the other side you also have a sharply prebent section which makes the single-pole wall almost vertical. Side view showing how vertical is the tent’s back. The view from the opposite side, without the fly showing the prebent poles. They have added also a ridge pole shown above, which lifts the side walls (where the doors are) and makes them vertical, adding a lot to the volume and livability in the tent. The fly is with stargazing features which you can see in the pictures below; this means you can roll it up (from any of the two sides) and enjoy sleeping under the stars with only mesh above you. This same feature is in their other new tents launched in Fall 2017, namely in the Meteor 2 and Meteor 3 tents. Two stargazing configurations with the fly. The tent is lightweight enough even for backpackers. But this implies that it is suitable for practically any outdoor activity in all seasons except in winter. 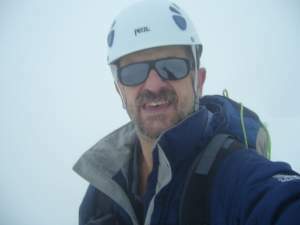 So it is great for hikers, mountaineers, cyclists, kayakers, etc. If you are on a motorbike tour, you will want to have such a tent. Its packed size is great, 16.5 x 6.5 in (41.9 x 16.5 cm). 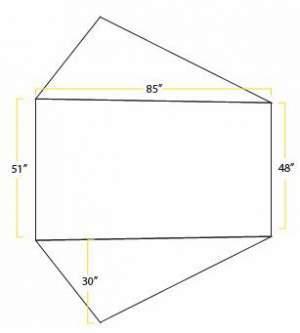 The floor area shown above is 29.2 ft² (2.71 m²) and the dimensions are 85 x 51/48 inches head/foot (216 x 130/122 cm head/foot). 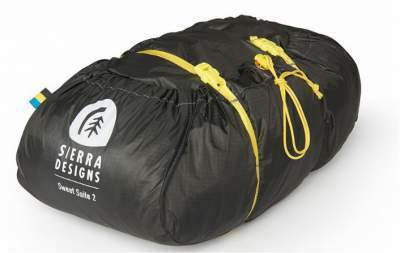 So there is enough space for two people, but you can use only very narrow sleeping pads, 50 – 60 cm. Two vestibules offer 1.66 m² extra covered space for gear so this adds a lot to the comfort of this tent. This can be a nice option if you do not have to carry it in a backpack, something for cyclists, motorbikers, kayakers, or just for a car camping. In this case, you can use it with a cot. There are many cots suitable for low tents of this type, some of them even for backpackers, so have a look here. 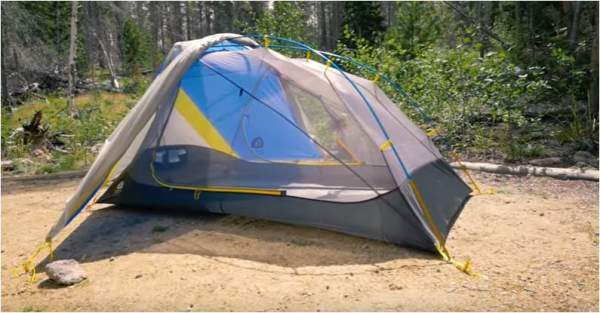 Such a great weight of this tent is partly due to the pole structure but it is also due to thin materials, which is nothing unusual for backpacking tents. So the poles are DAC Featherlite aluminum, the fly is 20D nylon ripstop, and the floor is 30D nylon ripstop. 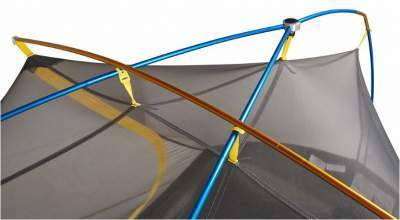 The main inner tent is all 15D nylon No-See-Um mesh. Here, DAC means Dongah Aluminum Corporation, a well-known pole manufacturer. The tent provides full protection, you have 1200 mm rating with Silicone PeU, FR CPAI84 both in the fly and in the floor. All seams are taped as usual. Here, FR CPAI84 means Fire Retardant by the standards of CPAI (Canvas Products Association International). Weight: 6.8 oz (193 g). Dimensions: 81 x 47/43 in (head/foot) (205.7 x 119/109 cm (head/foot). Storage bag size: 10 x 7 x 0.8 in (25.4 x 17.8 x 2 cm). Storage bag weight: 0.4 oz (12 g). Fabric: 68D Polyester Taffeta, WR/PU 1800 mm, FR. Type: semi-freestanding, 3-season, 2-people tent. Minimum weight: 3 lb 3 oz (1.45 kg). Packaged weight: 3 lb 10 oz (1.64 kg). Dimensions (L x W): 85 x 51/48 inches head/foot (216 x 130/122 cm head/foot). Floor area: 29.2 ft² (2.71 m²). Vestibule area: 8.9 ft² + 8.9 ft² (0.83 m² + 0.83 m²). Packed size (L x W): 16.5 x 6.5 in (41.9 x 16.5 cm). Poles: Y-shaped 3 poles hubbed together + 1 ridge pole. Pole material: DAC Featherlite aluminum. Fly: 20D Nylon Ripstop, Silicone 1200 mm PeU, FR CPAI84. Floor: 30D Nylon Ripstop, Silicone 1200 mm PeU, FR CPAI84. Clearly, the Sweet Suite 2 is not a match for the other two which are the lightest backpacking tents on the market. But backpacking is not the only outdoor activity. So the Sierra Designs Sweet Suite 2 Tent is indeed quite unique, lightweight, reliable and versatile, but it comes at a price. I trust the brand behind this tent and if you can afford it, I can fully recommend it. Do not be confused with this semi-freestanding terminology. Think about a tripod; these poles are the same, so you can pitch the tent on any terrain. Note that they have the Sweet Suite 3 Tent as well. There are many tents described in this site, so check my page with tents and shelters. In particular, check the same brand’s tents Meteor 2, Clip Flashlight 2, and Divine Light 2 FL, all new 2017 models. Check also this new Marmot Force 2 tent. If you need something more in the basecamp-style, check this Vango Omega 250 with two separate rooms. Thank you for reading. Please use the comment box below in the case of any comment or question. I wish you a nice day.